My first attempted solution was to clear the cache and all the data the Chrome browser had stored. That didn’t help. Thinking the problem may be with the Chrome browser, I started using the default browser that ships with Android. Of course, that browser is very similar to Chrome (they are based on the same base software, Chromium). So, when the stock browser had the same problems, I thought it might be still related to the Chromium browser base. This led to Wrong Solution #3. I installed Mozilla’s mobile browser for Android thinking the problem was with Chrome. Nope. The same thing happened in Mozilla’s browser – it would freeze after loading about half way and never finish. Occasionally it would load, but sometimes it would take upwards of 10 minutes or more. 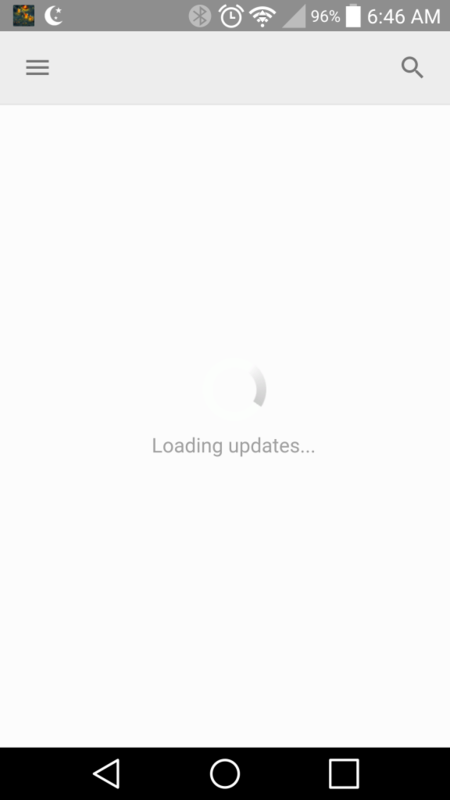 I checked Feedly’s website and searched online to see if there were problems with Feedly loading for other people and no one was reporting any. Whatever the problem was, it seemed to be unique to me and my phone. Not sure what to do about Feedly, I tried deleting all of its cached files and other data. That didn’t fix the problem. I then tried to uninstall the Feedly app and reinstall it. That worked, one time. Then the problem returned. At this point, I was kind of at wit’s end. Two of the apps I use really often were not working – Chrome, and Feedly. I didn’t know what else to do. Then I started considering what the two have in common. That led me to realize that I had an ad blocking app installed. I wondered if the ad blocking app was some how causing the two apps not to work. That would be pretty nasty of both Google and Feedly, to reduce their functionality because I wasn’t looking at their ads. But I was getting desperate. My last smartphone, a Samsung Galaxy S3, would periodically start running a bit slower and I would start getting weird messages (sometimes ads). That usually meant I had installed some app I should not have (I like trying out new apps) and then I would go through and uninstall as many unnecessary apps as I could (and if that didn’t solve the problem, I’d wipe the phone and start over). Thinking I may need to do the same thing on my LG G3, I started scanning through all the apps on the phone. I found a few I could uninstall, but I haven’t actually tried out that many new apps. However, in the process of scanning through the apps I had installed, I found one I didn’t recognize. The app is called “Data Optimizer.” I knew I didn’t install that. Plus, something with a name like “Data Optimizer” just sounds sketchy to me. So, I selected it to see what it was, and that’s when I found the problem. When I initially opened up the Data Optimizer app, under Storage, the Total was 1.6 gigabytes. Most of that was Cached data. 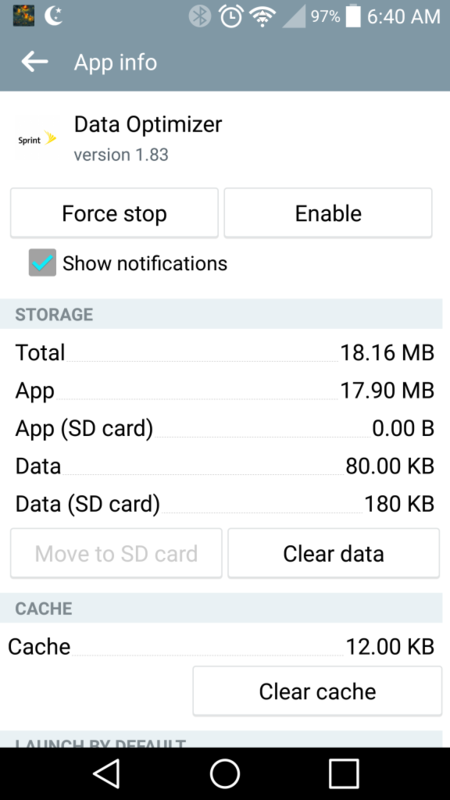 Perhaps the app is designed to periodically clear out the cache and stored data and for some reason it didn’t on my phone. Perhaps not. What I can gather is that this app was caching a ton of data, supposedly to help improve my browsing experience. But something went wrong somewhere and instead of speeding things up, the app completely destroyed my browsing experience. I’m assuming that both Chrome and Feedly were trying to access files in the Data Optimizer cache, but because it was so huge, it was having a hard time retrieving those files. As a result, both Chrome and Feedly were freezing up most of the time. Anyway, I deleted the cache and all the stored files, then tried opening up Feedly and Chrome. Both worked perfectly, as if the phone were brand new again. The Data Optimizer app was the problem! Again, the above screen capture of the Data Optimizer app is from after I cleared the cache and deleted all the stored files. I also disabled the app (that’s why there is now an “enable” button in the app) to prevent it from doing this again. Not sure if I should enable the app now, but I don’t want to run into the same problem in three months when the app’s stored files get huge again. So, I’m just going to leave it off and see what happens. Anyway, I’m posting this here in case anyone else runs into the same problem. It turns out, an app that was supposed to speed up web browsing was what had killed my web browsing, slowing it to a crawl or stopping it altogether. Sprint’s Data Optimizer app was the problem. Once I realized this, I was tempted to root my phone just to get rid of that app. But it appears that the app is now permanently disabled, so I shouldn’t have the same problem again. At least, I hope not! Thank you so much for this! I have a web page that shows me the schedules, statuses and locations of buses, that I use every day to get to and from work. I’ve been using it for a couple of years, and it was working fine on my new LG G3 for the first couple of months… then it started getting stuck, only showing part of the page, never showing the map or bus locations. I couldn’t figure out what was wrong! The site worked fine on other devices. I tried clearing the browser path, rebooting the phone, but they didn’t work. This trick put me on the right path! Though I had to go to Settings > Smart Cleaning, tap Temporary Files and tap Clean. Tracey, glad it helped. I was super frustrated about this as well. Wow, this seems to have really worked so far for my G3! This last month has been so frustrating! Sprint and their hopeless apps! Thanks a lot! Noticed a message last week that ‘Data Optimizer installed’. Hadn’t asked for this install, searched and found out it was the Sprint Data Optimizer. Using up loads of storage on my phone for the data cache (500MB+). Cleared data cache. After reading this (and the few other articles I could find on the Data Optimizer), decided to disable. Unfortunately, it UNINSTALLED the Data Optimizer (even though there was no uninstall option and I clearly selected disable) and my data services haven’t worked since. Phone at the Sprint store right now getting wiped and reinstalled. Others appear to have disabled this with no problems, but this was my experience.